New Enemy: Nyau! Break the weapon they dropped for a chance to obtain an item. Nyau can summon scary bosses. Revised some of the items listed in EP1&2’s Matter Board. Expanded the range of available ‘Item Matter’ search nodes for the Matter Board. 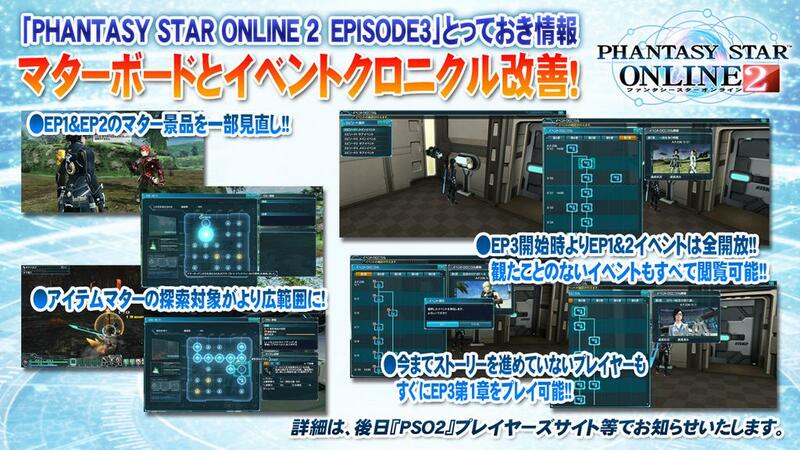 All Ep1&2 events are unlocked when Episode 3 starts. Even players who haven’t advanced through the story up until now can play Episode 3 Chapter 1 immediately. Matoi returns in a new outfit. 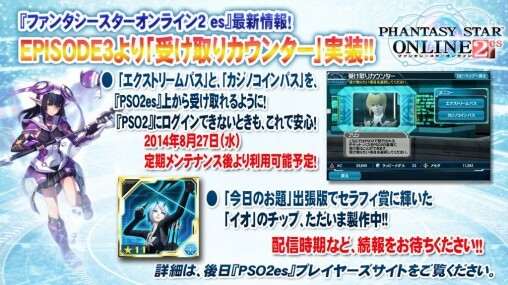 Obtain an Extreme Pass or Casino Coin Pass from the Reception Counter in PSO2es. This list contains information gathered from attendees who visited the Festa. The information below cannot be verified at this time and is subject to change. Keep in mind this information is not exhaustive and certain details may be missing. They’re planning on making a short 7-8 minute movie that summarizes the story events so far. They’re planning to add new casino games in the future. You’ll have to pay attention to a promo-video to see if you’ll receive Matoi’s Partner Card. A Japanese inn team base is under consideration. 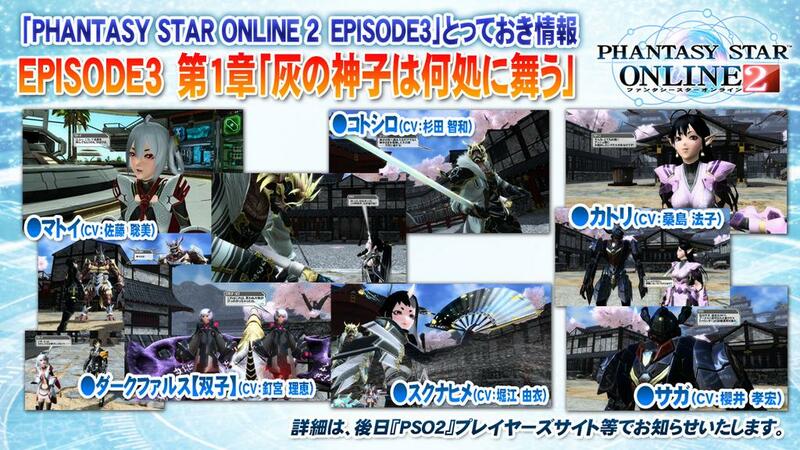 Japanese style weapons will be added for Planet Harukotan. They’re taking out the Gunner’s fist pump for chain trigger. You can also use it in the air. This also applies to Showtime. They’re looking into addressing the lag. They’re going to improve the PAs and adjust the animation speed and PP consumption for Gunslashes. Na Megid is ineligible for Charge Escape. No future plans to personally customize the AIS. As for using the A.I.S in another quest, they’re thinking about it. It appears to be in high demand. wasn’t it “myau” in, at least the localized, PS1-4? yeah localization was bad way back then, but I don’t know if it was spelled the same in japanese back then as it was here. Yes, it was Myau. This is not Myau. Rika’s Claw has always been “Falclaw” in japanese. When they localized PSIV, they changed Fal to Rika. 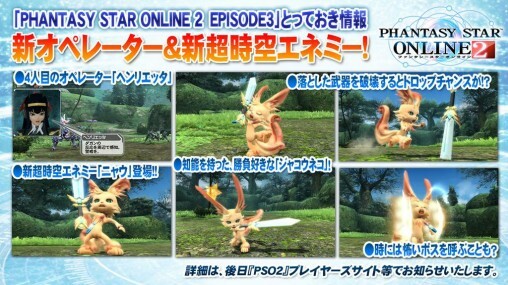 Myau was a character, but since this is a different setting, they probably thought to add a throwback type of character by adding it as an enemy. You forgot to add that Nyau can also sometimes call-forth some “scary” bosses. At least that’s what it says in the preview picture. Same with Il Foie, obviously. In before AIS customization and their widespread usage comes earlier than any sort of MAG system update. the Mags aren’t in dire need of an update. Also. the “in before” stock phrase is old hat. Wow dude, why did you feel the need to bring up that bit about the “in before” phrase? Who CARES if it is old? This is the Internet, you’ll see that a lot, get used to it. Also, for your reading pleasure, Doge. All your base are belong to us. Shazbot. Don’t taze me bro. I can haz cheezeburger. I used to be an adventurer like you, but then I took an arrow to the knee. I agree Mags don’t need any update. It’s not a clone of Myau. It doesn’t even look similar to Myau in any way aside from the fact that they’re both cats. I like old Phantasy Star games too, but that doesn’t mean every new thing is a callback. Looks like it all right. It’s extremely obvious that it is a throwback to the original Myau from PS1. he even has the vial around his neck. sorry i don’t have psn, pc only here. ooooof course. the thing where losing your charge on it really is a nuisance is the thing that you can’t dodge while charging. okay, I understand that with as cheap as the last fight of ep2ch5 can be, that there would be a lot of folks not quite up to finishing and still interested in proceeding… but seriously just make that fight easier instead of letting people go “tl;dr” about the plot. yeesh.